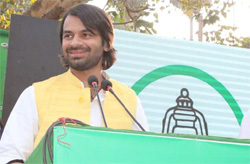 PATNA: Setting matters worse for the Lalu family on the eve of the parliamentary elections, Rashtriya Janata Dal chief Lalu Prasad Yadav's elder son Tej Pratap Yadav, who had earlier quit his post of sanrakshak (mentor) with the student wing of the party, on Monday launched a new party called Lalu-Rabri Morcha, named after his parents. Tej Pratap says he will contest independently from Saran constituency of Bihar, which his all-powerful younger brother Tejashwi has given to Tej Pratap's estranged father-in-law. He told a press conference, "We demanded tickets for two seats. Seohar was one. We know BJP, RSS will strategically take advantage of the situation. Saran has been a turf of Lalu ji. I want to request Rabri Devi Ji to contest from Saran. If she will not contest then I will fight independently from Saran seat". He tweeted on Thursday, "I am resigning from the post of Chhatra Rashtriya Janata Dal Sanrakshak. Those who think I am ignorant are ignorant themselves. I am well aware of who is worth what." Bitter fighting has been going on for some time between Tej Pratap and his younger brother, Tejashwi Yadav. Tej Pratap resented his father-in-law Chandrika Ray, an RJD leader, being named as a candidate from Saran, which is a Lalu citadel (Lalu Yadav is currently in jail in connection with corruption cases of the fodder scam.) Tej Pratap had filed for divorce from Chandrika Ray's daughter Aishwarya some six months back. He also wanted two of his supporters fielded in Jehanabad and Sheohar. Tejashwi had announced Chandrika Ray as candidate from Saran last week-end. Tej Pratap, although the elder one, has been relegated to a lower status and Tejashwi always looked like the heir to Lalu's leadership. The latter was Deputy Chief Minister in the previous Nitish Government while the elder was only a health minister.